Glutathione cream: will it lighten your skin? Glutathione cream, lotion, and soap won't whiten your skin! 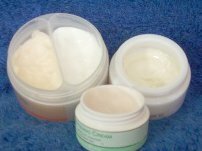 Glutathione cream, lotion, soap and similar preparations do not whiten the skin. Cosmetic manufacturers get away with making outrageous claims like "whiter skin in 2 weeks" because there is no scientific or government body that regulate them. Anyway, the point is, if you buy a cosmetic, there is really no guarantee that it will deliver its promises. That's just the fact of life. It all boils down to trial and error. See which products will work for you. Everybody's skin and body are different. Therefore, no one product suits all. So, what about glutathione creams or lotions? Let's go back to the basics. Glutathione is manufactured inside the cell. It can NOT penetrate the cell because it is too large a molecule. Again, picture a basketball an shoot it in a golf hole. It won't fit. The same is true for glutathione. It cannot enter our skin cells by using topical solutions such as creams, lotions, and even soaps. So forget about using glutathione soaps or creams! If you plan to use glutathione to whiten your skin, forget about lotions and creams. Leave that to tried and tested skin whitening ingredients like licorice and kojic acid. Papaya soaps also help in exfoliating your skin which aids in skin renewal and whitening. You might want to check the labels for ingredients used in so-called "glutathione lotions." Don't be surprised to see other whitening ingredients such as Vit.C and kojic acid in the label.This is simply because glutathione cannot whiten your skin if directly applied. Manufacturers of these "glutathione" products just put the "glutathione" because it is a popular skin whitening ingredient. It is a indeed a powerful whitening agent, but only if it is taken internally as in glutathione supplements or intravenously and in high doses. Know the difference. I hope this helps. Good luck to your skin whitening efforts! Do you have a Glutathione Story for the whole world to know? Tell us about your success story and it will be published in this website. You can even have your friends "like it" for Facebook! Share your glutathione Story amazing here! Return from glutathione cream to "Skin Whitening"